Bend Ale Trail 3.0 launches today! Here are 7 tips for navigating your beerventure. Next month, the Bend Ale Trail will mark its four-year anniversary. We’re getting a jump on the celebration this week by launching Bend Ale Trail 3.0, featuring a newly-updated Bend Ale Trail Atlas and two new breweries: Riverbend Brewing and Rathole Brewing. We’ve also introduced a brand new prize structure that lets you get the most out of your beerventure. In honor of the new release, here are a few tips for maximizing your Bend Ale Trail experience. 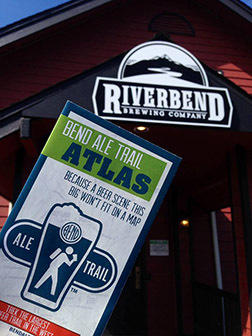 The new Bend Ale Trail atlas in front of one of the newest breweries to join the program, Riverbend Brewing. Gone are the days when you can safely hit all the breweries in a three-hour span (something I accomplished more than once back when there were only seven or eight stops). The new Bend Ale Trail atlas features 14 (yep, 14!) breweries. While no purchase is required to obtain a passport stamp at any of the breweries, half the fun is sampling the suds at all the locations. With that in mind, you want to be smart about your routing. Your best approach is to study the map beforehand online, in your printed Bend Ale Trail Atlas (available at all participating breweries and the Bend Visitor Center downtown) or in your free app for Droid or iPhone. While there’s a good cluster of breweries in and around downtown, there are now a fair number outside that zone. One strategy is to start with the outlying breweries, including Worthy Brewing, newcomer Riverbend Brewing, and Cascade Lakes Brewing Company. Yes, I realize those three breweries are in completely different directions, but the objective here is to start early with the ones that require driving or biking to reach. From there, you can leave your car in a safe location and maneuver on foot between the breweries near the Old Mill District. A good route there is to start with Rat Hole Brewing, then Crux Fermentation Project, Brew Werks, and finally the Deschutes Brewery brewing facility. A sane beer drinker would call it a day here, but the ambitious among you (or those limiting yourselves to small samples at each stop) could theoretically keep going on foot to Good Life and 10 Barrel from here. The cluster of breweries in Downtown Bend makes another nice batch to hit on foot. A fairly easy route there is to start at Boneyard, then hit McMenamins Old St. Francis, then the Deschutes Brewery pub if you didn’t already hit the brewery itself (though you can always do both to enjoy both the impressive facility tour and the equally impressive pub fare). From there, continue on to Bend Brewing Company and Silver Moon. And of course, don’t forget Three Creeks Brewing in Sisters, which makes an excellent excuse to plan a little day trip to this cute town 22 miles west of Bend (see this post on road trips for tips and ideas). Be sure you know everyone’s hours of operation before you set out. For instance, the Deschutes Brewery warehouse stops offering tours and tastings at 5 p.m. You can still get your passport stamped at the downtown pub, but the warehouse tour is a pretty cool highlight you really shouldn’t miss. 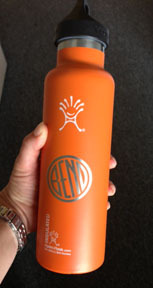 A Hydro Flask filled with water is a great tool to take along on your Bend Ale Trail adventure. You also want to keep in mind that Boneyard’s tasting room closes at 6 p.m., so plan to hit them a little earlier. 10 Barrel is always packed to the gills, so your best bet there is to avoid lunch hour or dinnertime. Hours at all breweries are subject to change seasonally, so when in doubt, call first. Eat a hearty meal before you set out. Bring your own water bottle or ask for glasses of water at brewery stops so you stay well-hydrated. Order food at pubs throughout your journey so you always have something in your belly. Opt for smaller schooners instead of full pints, or stick with a little sample every now and then instead of glugging whole beers. Above all, be responsible. Which leads to the next topic. Cowboy Carriage – one of many fun ways to trek the trail without drinking and driving. Walk. Especially if the weather’s nice. It’s a great way to see Bend. Arrange a shuttle, a pedicab, or even a Segway outing with The Bend Tour Company. Add a culinary twist to your beerventure with the Fermentation Tour from The Well Traveled Fork. Book a half-day tour with The Bend Brew Bus. 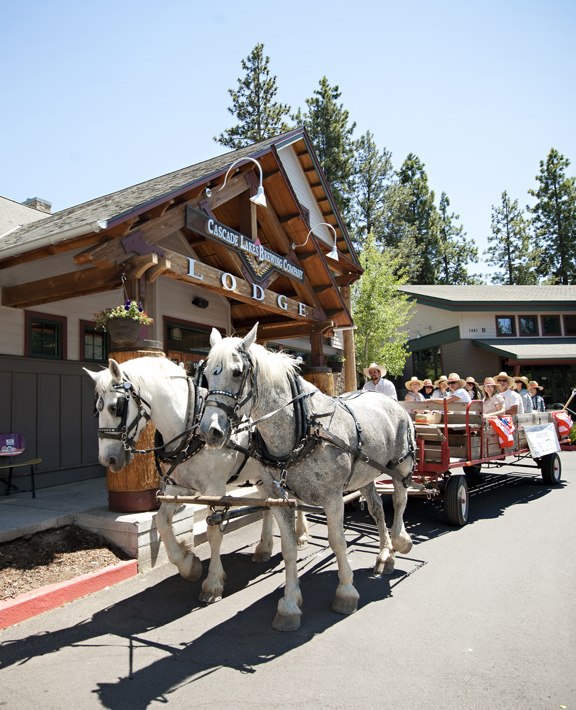 Hit the trail on a horse-drawn carriage with Cowboy Carriage Company. Pedal a bicycle made for 14 with The Cycle Pub of Bend. Cruise on an electric bicycle with Let It Ride Electric Bikes’ Brewdie Tour. Head out with in a 1980s-style trolley with The Bend Trolley. Try a personalized, four-person, six-hour tour with Bend Adventure Tours. Travel the trail in style with a limo from JD’s Car Service. Arrange for Sober Dudes to take you home in your own car. Seriously, guys, don’t drink and drive. I once had to bail a pal out of jail for making this mistake. He was lucky, as were the other people in his path that night who could have been injured or killed if things had gone differently. You DO NOT want to mess around with this one. 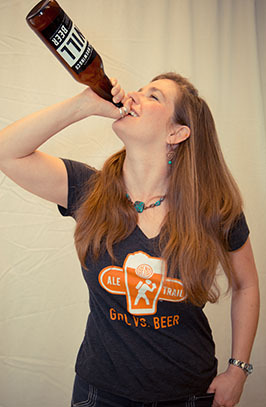 Blogger Tawna in her Girl vs. Beer t-shirt. Besides the beer, one of the best parts of the Bend Ale Trail is the fact that you earn prizes for collecting passport stamps at the breweries you visit. With the newly released Bend Ale Trail atlas comes an update in the prize system. Participants can now earn a commemorative Bend Ale Trail Silipint pint glass for visiting just 10 of the 14 breweries. Those who visit all 14 will not only receive the Silipint, but also a Bend Ale Trail bottle opener. Also new to the Bend Ale Trail program is the creation of Bend Ale Trail month. Each November, anyone who completes the Bend Ale Trail and submits the passport at the Bend Visitor Center will earn a free trophy. When it’s time to turn in your passport and collect your prize, remember the Bend Visitor Center on the corner of Lava and Oregon downtown is open Monday through Friday from 9 a.m. to 5 p.m. and Saturday from 10 a.m. to 4 p.m. We’re closed Sundays until our summer hours kick in Memorial Day weekend. Between Memorial Day and Labor Day, the Visitor Center is open on Sundays from 10 a.m. to 4 p.m. 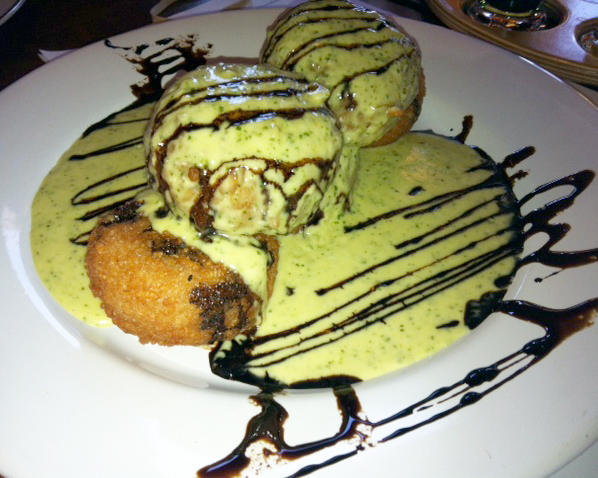 The risotto cakes stuffed with goat cheese and served with pesto cream & balsamic reduction at Old Mill Brew Wërks. Call me a neurotic planner, but I love checking before I set out so I know who’s got seasonal specials and don’t-miss food deals. I’m a huge fan of the food at Old Mill Brew Wërks, so I always make sure I hit them around mealtimes or happy hour for the best deal on their to-die-for risotto cakes stuffed with goat cheese and served with pesto cream & balsamic reduction. Their bacon-wrapped scallops are also a culinary highlight here. The cream cheese jalapeño wrappers at Riverbend Brewing are another item to include on your must-try list. These bad boys are hand-rolled and stuffed with applewood smoked bacon, cream cheese, and jalapeño and served up with a divine Thai chili sauce. Knowing McMenamins Old St. Francis has a late-night happy hour starting at 10 p.m. makes it a great last-stop for $3.50 pints and $2.50 Cajun tots. Don’t be afraid to study your map carefully or call around beforehand asking about specials. Above all, have fun out there as you explore our beloved beervana. See you on the trail! Previous article: Let’s do a springtime stroll around the Tin Pan Alley Art Collection in Bend!